With the Holidays being only around the corner, there will be tons of Holiday parties going on. This means there will be lots of delicious food and drinks being served. 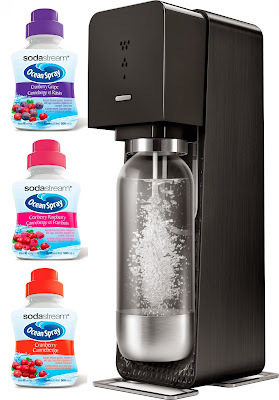 Why not make one of those drinks from the awesomeness that is SodaStream?! If you remember a couple months back, we had a great opportunity to review the SodaStream. My family absolutely loved it and we still use it. I've had a few gatherings and have gotten nothing but compliments about the SodaStream. This would make for a perfect gift for a family member or friend, especially the hostess in your life. What my family and I both love about the SodaStream is that it's Eco-Friendly. You save money and you help the planet by purchasing less plastic bottles. Each syrup flavor makes 12L of pop for around $7, that's less than a dollar per liter. Who doesn't love to save?! You can make soda from home that the entire family can help make and enjoy. My kids absolutely love making their favorite drinks with our SodaStream. It sits next to my Keurig and Coffee maker as an option for something to drink when I have visitors. We also love that SodaStream is branching out when it comes to their flavor syrups. They've worked with Kool-Aid, Country Time, Crystal Light and now they're teaming together with Ocean Spray to bring you three new flavors: Cranberry, Cranberry Grape and Cranberry Raspberry. SodaStream is offering one of my lovely Canadian readers one SodaStream Source Plastic Black along with the Ocean Spray flavours retailing for about $150!